OK well now I found the solution to not only my laziness, but my dry skin during the spring and beyond. 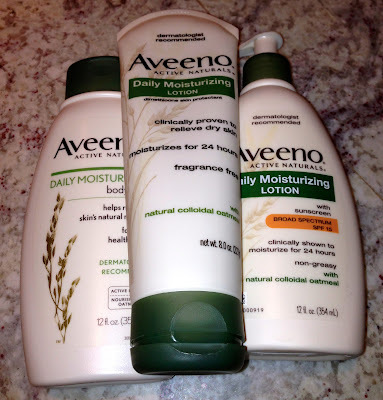 I shower in the morning with Aveeno Daily Moisturizing Body Wash, then follow up with the Daily Moisturizing Lotion with SPF 15. I am set for the day, with out having to re-apply lotion. Did I mention it smells good too. As I have gotten older, strong scented lotions give me a headache. Yeah so weird, but I just cant stand the scents of floral, or perfumed lotions anymore. Aveeno Active Naturals has a light scent, which is fresh and kinda yummy smelling. Well it makes sense since they have plenty of natural ingredients that are great for your skin. Lets not forget about the face, Aveeno has plenty of great stuff for your face. Aveeno has a tinted moisturizer with SPF 30 for those lazy days (here I go again) when you don't want or have time for makeup. Again dual purpose, you moisturizer, you have UVA/UVB coverage and add some color to your face all with one product. Voila! Out you go to enjoy a beautiful spring day. Prizes will include: 3 Winners: Total prize value of $150 each (Aveeno products valued at $100 and a $50 gift card) You can RSVP on Facebook here (link). Thanks for reading!! *Disclosure: This post is in collaboration with Latina Bloggers Connect and Aveeno. I was paid and received products for review. However this is my honest and personal opinion of the products. For best results you should always try out products for yourself. Love Aveno! Great meeting you at Lucky Fabb!